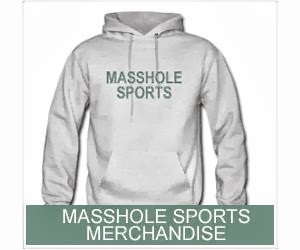 Masshole Sports: Mike Milbury Says He Would “Strongly Consider” Coaching The Bruins When Claude Julien Gets Fired. And So It Begins. Mike Milbury Says He Would “Strongly Consider” Coaching The Bruins When Claude Julien Gets Fired. And So It Begins. With the Boston Bruins struggling right now Claude Julien's job may be on the line. If their coach gets fired, could a familiar face take over the helm of the Black and Gold? Before making a commitment to Julien eight years ago, NBC Sports' Mike Milbury was a candidate for the job. Would he be interested if the job opened up in the near future? I'm not chomping at the bit [to coach]. But when somebody dangles that carrot in front of you and gives you an opportunity like that, there's so few chances like that. I'd have to say I'd strongly consider it if that came around." I am so sick and tired of hearing Claude Julien come out after a loss and say, "oh well. We didn't play well and we need to play better." This team needs a coach with balls and at least a little bit of passion. The players have obviously stopped playing for Julien. I mean, they have the pieces to compete for the Stanley Cup. Tuukka Rask won the Vezina last year for Christ's sake. He isn't the problem. There are 29 other teams in the league that would kill to have Zdeno Chara anchoring their blue line. He isn't the problem. The problem is Peter Chiarelli didn't have the balls to trade for a first line right winger this offseason and that Claude Julien has lost that locker room. 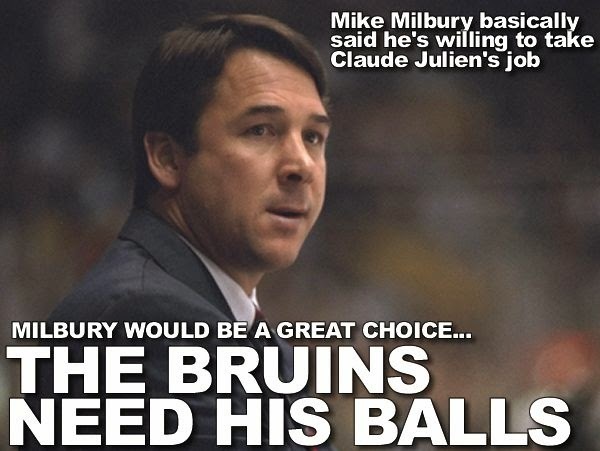 If Cam Neely had any balls, he would fire Julien right now and replace him with Mike Milbury. At least they would have the chance to save the season then. But what most likely will happen is the Bruins won't make the playoffs this season and the players will get their wish. Claude Julien and Peter Chiarelli will be fired. And I hope to Christ that Cam Neely hires Mike Milbury. Sure, he sucked as head coach of the Islanders but that was a long time ago. This particular team, right now, needs someone with brass balls and with Bruins old time DNA.